Team Superschools (TSS), a fun, inspirational and exciting way of raising funds for primary schools using the power of sport. TSS sees pupils rub shoulders with their Olympic and Paralympic heroes. We promote healthy lifestyles and raise aspirations amongst young children. What Makes TSS Such A Success? In the past 10 years over 513,000 pupils have taken part in a TSS event. Over £774,000 has been raised and retained for schools. World Class athletes boasting Olympic, World, European and Commonwealth medallists have passed on their expertise, experience and enthusiasm to thousands of children across the country. "A massive thank you to Team Superschools for the amazing morning they provided for all our staff and children yesterday." "What an amazing day! Thank you to everyone that made it possible!" "Excellent efficiency and communication. Event day was great fun and Chris Tomlinson was very good with the children." "We would love to do this again in the future. Experience was brilliant!!! Truly memorable for all children and staff." "I have never seen such commitment as that inspired by your visit - I was exhausted watching them." "Everyone thought it was brilliant. Thank you for inspiring our children. Olympian was amazing." "The event was extremely well organised and ran smoothly. The children were thrilled... and thoroughly enjoyed taking part the in the event." 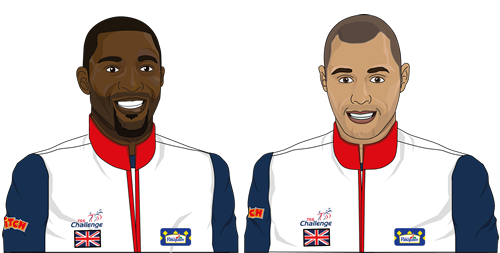 We are Olympic Champions Darren Campbell MBE and Jason Gardener MBE and we co-own Team Superschools. We have both been fortunate to enjoy success on the biggest stage of all but our love of sport began at grass roots level and our own experiences as primary school children. The power of school sport changed our lives so we know first-hand how much of a positive impact sport can have on young children, whether that be in pushing them on towards becoming an Olympic Champion, encouraging them to be the very best that they can be in life, or just keeping them fit and healthy. Meeting our sporting heroes at a young age had a profound effect on our own lives and achievements inside and outside of sport and we're keen to give today's generation the chance to experience something similar and, hopefully, even more special. We look forward to visiting your school and exceeding your expectations. Copyright © 2014 Team Superschools. All rights reserved. Company registered in the UK, No. : 6526864.